FEBRUARY 14TH IS NO LOVE LOCKS DAY. For the fourth straight year, No Love Locks is declaring this February 14th, “No Love Locks Day,” with a Valentine’s Day social media campaign encouraging people to show their love for Paris by not hanging a lock on our bridges and monuments. SHARE OUR CAMPAIGN ON SOCIAL MEDIA, FEBRUARY 10-14! Encourage your followers to retweet and share the love for Paris! We need you! Let’s send the message to visitors to the city that hanging a lock on the historic monuments and public spaces of Paris is vandalism that damages the city and hurts the people of France—culturally, economically and emotionally. It’s time for tourists to act responsibly, and that means showing their respect and empathy for Parisians by not destroying the beauty and heritage of their city. Paris is a romantic place with so much to offer lovers—beyond destructive padlocks that say anything but love. Meme #2: BEFORE & AFTER. Lest we forget, this is what “love locks” did—and still do—to the UNESCO World Heritage site in Paris. Share this as a reminder of why the trend is vandalism disguised as sentiment. It is with great sadness that No Love Locks announces the passing of co-founder Lisa Taylor Huff, after a battle with cancer. Lisa loved Paris passionately, and remained active in the fight to save its heritage throughout her own personal fight. “I would rather fight for something, then against,” she said. 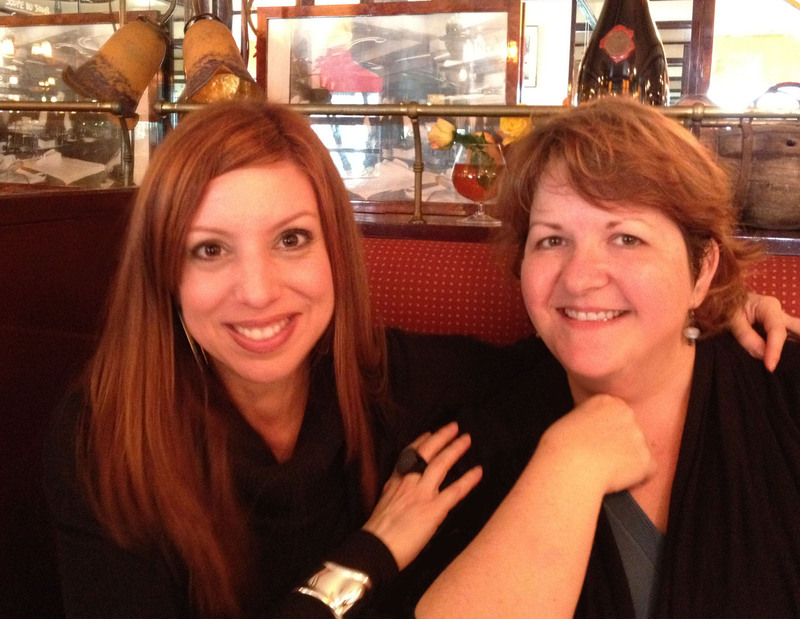 Lisa came to Paris in 2006, and in 2013, attained dual US/France citizenship. She is survived by her husband and her step-children, as well as her family in the States. Lisa spoke and wrote extensively about the plight of the fragile heritage sites in the city, and was interviewed internationally on the subject. But she was more than the co-founder of No Love Locks. Lisa was a writer, blogger and life coach, helping people to achieve their dreams. Her generous spirit, kindness, and passion touched the lives of many—from her closest friends and family, to the thousands of people who read her blog. You can discover her inspiring words here. On a personal note, I’ve known Lisa since I was 16, and have lost a great friend, someone who was like a sister to me, and will miss her every day. We began No Love Locks together because we wanted to do something to help preserve the beauty and history of the city we loved. 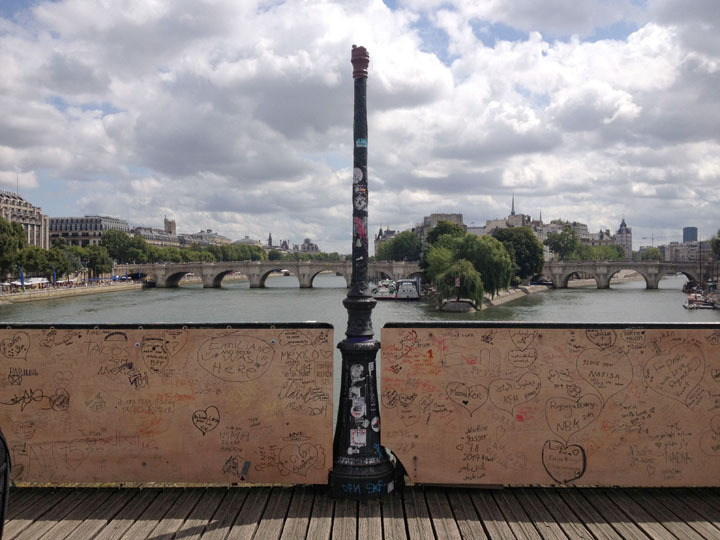 We were both surprised by the attention, support and success No Love Locks has achieved, and happily, Lisa was able to witness and celebrate the removal of the locks from her beloved Pont des Arts. But the fight is not over. There are still many other bridges and sites around Paris endangered by “love locks,” and only when the city creates a ban on this practice will the authorities have the power to finally end this form of vandalism, and the heritage sites of Paris can be restored and preserved for future generations. No Love Locks will not cease until there is a ban in place, but I will need your help to achieve this. In the coming months, I will be posting on Facebook ways you can help, either by donating your time and special skills, or by supporting or helping to organize events in the city. No Love Locks cannot succeed without you, because without my co-founder, I am only one person. But with you, No Love Locks will be nearly 100,000 strong. Thank you for your continued support of the efforts of my late co-founder and myself, as we fight to preserve the beauty and history of Paris. C’est avec une infinie tristesse que No Love Locks annonce le décès de notre co-fondatrice Lisa Taylor Huff, suite à sa bataille contre le cancer. Lisa aimait passionnément Paris et est restée active dans le combat pour en sauver le patrimoine tout au long de son propres combat personnel. Elle disait : “Je ne veux pas lutter contre ; je veux lutter pour”. Lisa est arrivée à Paris en 2006 et a obtenu la double nationalité française et américaine en 2013. Son mari et ses beaux-enfants en France ainsi que sa famille aux USA lui survit, sa mère, sa sœur, son beau-frère et leurs enfants. Lisa a fait assidûment campagne pour la préservation du patrimoine parisien. Avec ses propres mots :” J’ai été passionnée par notre cause depuis le début, quand Lisa Anselmo et moi avons commencé à parler de notre désarroi mutuel devant la condition déplorable de certains ponts au centre de Paris, principalement le Pont des Arts et le pont de l’Archevêché. J’ai toujours eu une relation personnelle profonde avec le Pont des Arts, depuis ma première visite à Paris dans les années 90, jusqu’à la première Saint-Valentin passée avec mon futur mari, lorsque nous avons pique-niqué sur ce pont en février 2008″. Lisa a écrit et parlé à de nombreuses reprises de la plaie qui touche les sites fragiles du patrimoine à Paris, et elle a souvent été interviewée dans de nombreux médias français et internationaux à ce sujet. Mais elle était bien plus que la co-fondatrice de No Love Locks, Lisa était une écrivaine, une blogueuse, une coach reconnue aidant les gens à réaliser leurs rêves. Son esprit généreux, sa gentillesse et sa passion ont influencé les vies de beaucoup de personnes – depuis sa famille et ses amis proches aux milliers de personnes qui lisaient son blog. Vous pouvez découvrir ses mots inspirants sur son blog (ici). Sur le plan personnel, je connaissais Lisa depuis l’âge de 16 ans et j’ai perdu une grande amie, comme une sœur pour moi et elle me manque chaque jour. Nous avons démarré No Love Locks ensemble parle que nous voulions faire quelque chose pour aider à préserver la beauté et l’histoire de la ville que nous aimions. Nous avons été toutes les deux surprises de l’attention portée à No Love Locks, du soutien reçu et du succès obtenu. Heureusement, Lisa a pu célébrer et assister à l’enlèvement total des cadenas sur le Pont des arts qu’elle aimait. Mais le combat n’est pas terminé. Il y a beaucoup d’autres ponts et sites dans Paris mis en danger par les “cadenas d’amour”. C’est seulement lorsque la Ville interdira formellement cette pratique que les autorités auront le pouvoir de mettre fin à cette sorte de vandalisme, et que les sites du patrimoine parisien pourront être remis en état et préservés pour les générations futures. No Love Locks ne cessera pas son combat jusqu’à cette interdiction, mais j’aurai besoin de votre aide pour y arriver. Durant les prochains mois, je publierai sur Facebook des solutions pour que vous nous aidiez, en donnant de votre temps, en fournissant votre expertise, ou en aidant à organiser des événements dans la Ville. No Love Locks ne peut réussir sans vous, parce que sans ma co-fondatrice, je suis seule. Mais avec vous, No Love Locks représente 100 000 personnes. Merci pour le soutien permanent que vous nous apportez, à ma co-fondatrice disparue et à moi, dans ce combat pour la préservation de la beauté et de l’histoire de Paris. On Monday, August 11th, Paris City Hall launched a campaign targeted at padlock-crazy lovers. The message: “Our Bridges Can No Longer Withstand Your Gestures of Love.” The idea: take a selfie instead, and share it with #LoveWithoutLocks. Your image will appear on a special website alongside other enlightened lovers who choose not to vandalize the city’s most cherished heritage sites. What’s left of the Pont des Arts. A lamp missing, brought down by the weight of locks. After the heavy tourist season, Paris’s bridges are deeply in danger. This is an important first step in the fight against the padlocks now endangering two of the most important bridges in Paris, and spreading to 11 others along the Seine. It’s an effort to educate people and change their point of view. In Paris, some critics of the campaign call it “soft” and “ineffective.” And indeed, three months into the heavy tourist season here—the Pont des Arts now with over 15 collapsing panels—one wonders how this selfie initiative will even make a dent in the problem. Still, we hope #LoveWithoutLocks is the beginning of an aggressive campaign against “love locks” and that Mayor Hidalgo will now take a stronger stance on protecting the UNESCO World Heritage site along the Seine. In the meantime, we will continue to push for a ban on “love locks,” as it seems the only way to end this practice once and for all. Help us, along with Paris City Hall, to promote this lock-free expression of love. Share the hashtag LoveWithoutLocks and the official website, lovewithoutlocks.paris.fr.